The question is from regular polygon. It tests our understanding of angles in a regular polygon. CAT Geometry questions are heavily tested in CAT exam. Make sure you master Geometry problems. Triangles are heavily tested, the wonderful infinite-sided polygon that is the circle is also heavily tested. In between these two lies this great mass of regular polygons. 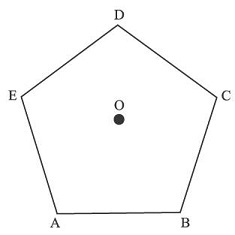 Question 8 : ABCDE is a regular pentagon. O is a point inside the pentagon such that AOB is an equilateral triangle. What is ∠OEA? Method of solving this CAT Question from Regular Polygon: Creating a new triangle by joining two existing ponits would help. 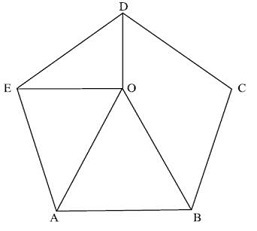 AO = OB = AB as the triangle is equilateral. AB = AE as this is a regular pentagon. Triangle AEO is isosceles as AO = EA. The question is " What is ∠OEA?"